Woodbridge, VA---Back for the fourth straight year, the Potomac Nationals are giving away a Fans Choice Bobblehead presented by Loyal Hygiene Solutions. 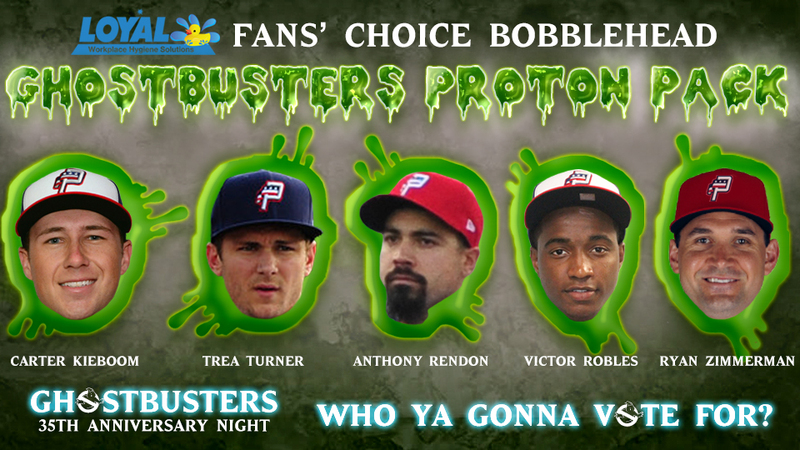 For the 2019 season, fans can vote on which former P-Nats player will be featured in bobblehead form on Ghostbusters 35th Anniversary Night, Saturday, July 6th. The bobblehead will be part of the Ghostbusters 35th Anniversary celebration, and will feature the winning player in Ghostbusters gear, with a proton pack and more! This bobblehead will be given away to the first 1,000 fans through the gates at the ballpark on July 6th! Fans can vote here, through various Potomac Nationals' social media channels, or via potomacnationals.com. Voting will run through January 31st, and the winner will be announced in February.